As the old adage goes, “Time heals all wounds.” Regarding UFC president Dana White’s beef with former heavyweight top contender Alistair Overeem (Pictured), so does a face-to-face apology. After Overeem flunked his pre-fight drug test to ruin his highly-anticipated shootout with champion Junior dos Santos, White bashed the controversial kickboxer for lying to his face. Although “The Demolition Man” had never flunked a drug screening, rumors regarding performance-enhancing abuse has circled around Overeem for the past several years. That’s why White and UFC co-owner Lorenzo Fertitta pressed Overeem on the subject prior to signing him to the UFC. The slugger assured them he would never produce a positive urinalysis. Overeem proceeded to fail an exam after just one fight inside the Octagon. 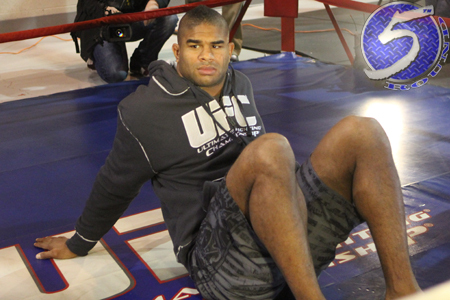 Although White said he wouldn’t fire Overeem over his mishap, which ultimately led to a nine-month suspension, he claimed to be out of the Overeem business. Any future conversations with the UFC would have to be done through Fertitta. However, following UFC 148‘s post-fight press conference, White revealed Overeem made an unplanned visit to the UFC’s corporate office this past week to smooth things over with his boss. “I saw him walk in, he was meeting with Lorenzo,” White revealed. “I [expletive] walked in my office and shut the door. He went downstairs and waited for 40 minutes until I called him upstairs. He then came in my office like a man, and [I have] nothing but respect for Alistair now. White wanted to keep their chat private, but he once again reiterated that the former Strikeforce champ would retain his top contender status upon return. While he was disgusted with Overeem for registering more than twice the legal limit for testosterone, White previously stated he would fight for the title when his ban was lifted. Overeem can reapply for licensing as early as December 27th. Which means the 31-year-old could return in time for the UFC’s New Year’s weekend extravaganza, exactly one year after his first and only fight for the company.